(PhysOrg.com) -- At this very moment, tens of thousands of home computers around the world are quietly working together to solve the largest and most basic mysteries of our galaxy. Enthusiastic and inquisitive volunteers from Africa to Australia are donating the computing power of everything from decade-old desktops to sleek new netbooks to help computer scientists and astronomers at Rensselaer Polytechnic Institute map the shape of our Milky Way galaxy. Now, just this month, the collected computing power of these humble home computers has surpassed one petaflop, a computing speed that surpasses the world's second fastest supercomputer. Each user participating in the project signs up their computer and offers up a percentage of the machine's operating power that will be dedicated to calculations related to the project. For the MilkyWay@Home project, this means that each personal computer is using data gathered about a very small section of the galaxy to map its shape, density, and movement. In particular, computers donating processing power to MilkyWay@Home are looking at how the different dwarf galaxies that make up the larger Milky Way galaxy have been moved and stretched following their merger with the larger galaxy millions of years ago. This is done by studying each dwarf's stellar stream. 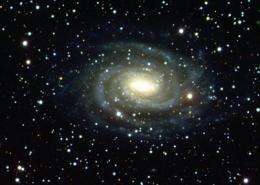 Their calculations are providing new details on the overall shape and density of dark matter in the Milky Way galaxy, which is widely unknown. "I was a researcher sitting in my office with a very big computational problem to solve and very little personal computational power or time at my fingertips," Newberg said. "Working with the MilkyWay@Home platform, I now have the opportunity to use a massive computational resource that I simply could not have as a single faculty researcher, working on a single research problem." "Scientists always need additional computing power," Newberg said. "The massive amounts of data out there make it so that no amount of computational power is ever enough." Thus, her work quickly exceeded the limits of laboratory computers and the collaboration to create MilkyWay@Home formally began in 2006 with the assistance of the Claire and Roland Schmitt Distinguished Professor of Computer Science Boleslaw Szymanski; Associate Professor of Computer Science Carlos Varela; postdoctoral research assistant Travis Desell; as well as other graduate and undergraduate students at Rensselaer. "When you use a supercomputer, all the processors are the same and in the same location, so they are producing the same results at the same time," Varela said. "With an extremely distributed system, like we have with MilkyWay@Home, we are working with many different operating systems that are located all over the globe. To work with such asynchronous results we developed entirely new algorithms to process work as it arrives in the system." This makes data from even the slowest of computers still useful to the project, according to Varela. "Even the slowest computer can help if it is working on the correct problem in the search." "This is truly public science," said Desell, who began working on the project as a graduate student and has seen the project through its entire evolution. "This is a really unique opportunity to get people interested in science while also allowing us to create a strong computing resource for Rensselaer research." All of the research, results, data, and even source code are made public and regularly updated for volunteers on the main MilkyWay@Home Web site found at: http://MilkyWay.cs.rpi.edu/. Desell cites the public nature and regular communication as important components of the project's success. "They are not just sitting back and allowing the computer to do the work," he says, referencing that volunteers have made donations for equipment as well as made their own improvements to the underlying algorithms that greatly increased computational speed. Varela jokes, "We may end up with a paper with 17,000 authors." I'm one of the donors and one of the user in the community always asking for some news and updates from scientists behind the projects. Anyway, this is a great article, but it doesn't stress enough on the merit of the community. If we had not been so active, milkyway wouldn't be second fastest distributed computing project. Nowhere in the article is cited the great work by Andreas Przystawik (PhD), aka Gipsel/Cluster Physik in the community. Without his work, GPGPU on milkyway would be a dream and 1 petaflop would be far far away, so the researches at Rensselaer institute. Sorry for my poor english, btw. Keep crunching and learn about BOINC if you don't. They should get on PS3.Folding@Home hit a petaflop in 2007 because of PS3's help. That's nice - but I'm in doubt, such distributed computing is economical in terms of electric energy consumption with compare to supercomputers (especially when considering energy consumption of WAN infrastructure). That's nice - but I'm in doubt, such distributed computing is economical in terms of electric energy consumption. It's so difficult to really understand it well! I like boinc because, first of all, it tries to divulgate some hint of science to normal people. I'm studying physics and so maybe i'm already into this type of talks, but I find really nice that so many people are involved! Folding doesn't use Linux, it's a standard feature on every PS3.And they would customize for the CELL instead of many different GPU's being used. The customize and many PS3 users should give a nice upgrade. I know that folding doesn't use Linux! also, you do not have to customize for many different GPU. ATi has Brook+/CAL and nvidia has CUDA. "Tomorrow" both will use OpenCL (it exists but is really new to develop safely and effectively on it). "As of January 2009, the Tesla computer platform delivers the best performance among all stand-alone systems being used in distributed computing projects like Seti@home, Spinhenge@home or Folding@home."